Pulling ourselves up by our “neckstraps” is an unconscious, painful habit. The solution is surprisingly simple. When we carry ourselves with the head thrust forward, we create neck pain, shoulder tension, even disc herniation and lower back problems. A reliable cue to remind ourselves how to shift the head back into a more stress-free position would do wonders for resolving these problems, but first we have to know what we’re up against. When it comes to keeping our head in the right place, posturally speaking, the neck is at something of a disadvantage. There are a number of forces at work that can easily pull the neck into misalignment, but only a few forces that maintain the delicate alignment of the head on the spine, allowing all the supporting muscles to work in harmony. 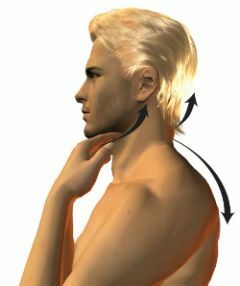 The concentration of muscles at the back of the neck helps to maintain an upright posture while freeing the front of the neck for breathing, speaking, and eating. The problem begins with the large muscles that converge at the back of the neck and attach to the base of the skull. These include the muscles of the spine as well as those running from the top of the breastbone along the sides of the neck (the sternocleidomastoids) to the base of the head. The concentration of muscles at the back of the neck helps to maintain an upright posture while freeing the front of the neck for breathing, speaking, and eating. The problem with this configuration is that it stacks the cards against good posture, since the upper chest is largely supported by the neck muscles that originate at the base of the head. If your head shifts forward, the weight of your front body drops down, pulling the base of your head down with it, shortening your neck and increasing its burden. If you’re not already suffering from this imbalance, it is easy enough to have a taste of it: simply shift your head forward, away from its natural center on top of the spine. This shortens the back of your neck, which immediately begins to grip, while the muscles at the sides and front of your neck slacken. The result is that your chest drops and begins to feel cramped and heavy, while your shoulders round forward and your shoulder blades slide away from your spine. Thus with a simple forward shift of your head, the weight of your front body is hanging from your neck as if on the yoke of an oxcart! 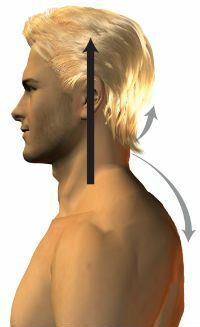 Many people who suffer from this postural imbalance go about “fixing” it the wrong way—pulling their head and shoulders back to “straighten up.” This only serves to tighten the upper back by overworking the rhomboids (the muscles that draw the shoulder blades toward the spine and up toward the neck), which shortens the neck even more since most of us tip our head back when trying to bring it more in line with the spine. Another strategy is to try to bring the head back by pulling the chin in, but this only flattens the neck and adds more tension. The problem with both of these corrections lies in where we are moving from—either the head or the chin. In both cases we are attempting to move from the outside in, usually according to an external reference point (e.g., “bring your ears more in line with your shoulders”). This attempt to force ourselves into a posture according to an outer standard of correctness usually leads to more tension. True realignment moves from the inside out, which is why a better reference point is internal, and closer to the center of our posture. The hyoid is a small horseshoe-shaped bone that “floats” at the top of the throat, surrounding the esophagus. It is not connected to the skeleton through joints or ligaments, but is suspended at the center of a subtle and sensitive network of deep “infrahyoid” muscles. This “net” of muscles extends to both the back and front body, connecting to the larynx, shoulder blades, and sternum, thus joining the inside of the rib cage to the front of the throat. There are also “suprahyoid” muscles connecting to the tongue, jaw, and base of the skull. From its place at the center of this network, the hyoid moves up and down as you swallow and speak. But while the influence of the hyoid is deep, movement of the hyoid is not a cause of good posture, but a cue. 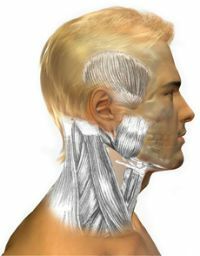 The tone of the muscles surrounding the hyoid influences the tone of the muscles supporting our posture. When the hyoid is in the right place, the neck and head are in the right place—and there is harmony in the tone of the muscles. A signal is sent especially to the muscles at the back of the neck that they can let go of their grip and relax. You can guide the placement of the hyoid by gently drawing the top of your throat back and up, so you feel as if it is “smiling” from ear to ear. A “smile” is better than a “correction,” because the subtle release that comes with a smile feels more like an “undoing” of stress than a “doing” or an imposition of alignment. The shift takes place as you soften and let go of any holding in the muscles at the base of your head. Your first temptation may be to pull your chin back, but the real shift takes place more softly from below the chin. In the beginning, you may want to guide the shift of the hyoid using your fingertips. Realigning the head and neck from the hyoid provides the opportunity for extension of the neck, but does not itself cause the neck to extend. 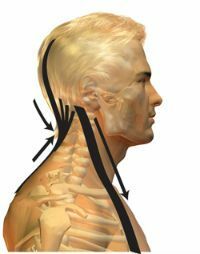 Neck extension comes from the action of a deeper, stronger set of core muscles located at the front of the neck bones. These core muscles—the longus capitus and the longus colli—are the only ones capable of counteracting the shortening at the back of the neck, and they need the help of good posture. 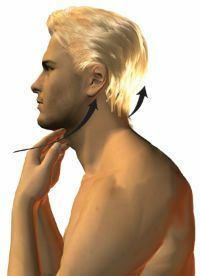 The longus capitus is located deep in the neck, just at the front of the uppermost vertebrae, and the longus colli extends just in front of the vertebrae through the entire length of the neck and into the upper back. You can feel the action of these core muscles when you lie on the floor and extend through the crown of your head. As they contract, your neck elongates and you will feel the back of your head slide along the floor. 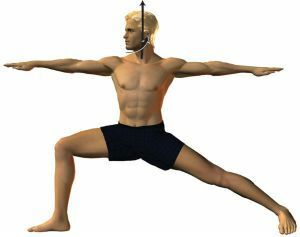 In yoga postures we use imaging cues to get the same result. When standing, for example, we might imagine “a string drawing upward at the crown of the head,” and when we do, the longus colli contracts and the neck lengthens. As these muscles become stronger, they can overcome the downward pull of the large muscles at the back of the neck that occurs when the head is misaligned. But this is only possible when we first align the neck from the hyoid, “undoing” the tension that would otherwise make this lengthening impossible. A variety of yoga poses gives us the opportunity to realign and thus release tension in muscles that shorten the back of the neck, while strengthening muscles that lengthen it. These include virabhadrasana II, trikonasana, and the other standing poses. Backbends help us to strengthen the neck as it extends fully; twists help to refine the alignment of the neck; and forward bends stretch the muscles of the spine and neck where tension resides. How we cue ourselves in each of these postures is vital, because if done poorly, they can create more tension in the neck and communicate it to the rest of the body. We see this often in standing poses in which students habitually shorten the back of their neck, hyperextending it as they hunch their shoulders—as if they were using their neck muscles to hold up their arms. For example, students frequently hunch their shoulders and tighten the neck in virabhadrasana II (warrior 2). We could correct the shoulder alignment by rotating the arms externally (palms up) to release the shoulder blades down the back, but this adjustment addresses a symptom, not the cause. The real “stuckness” in the pose lies at the base of the head, where the neck muscles are tense. If we draw the top of the throat (at the hyoid) back and up while gently extending upward through the crown of the head, the shoulder blades automatically release down the back and the body opens to the breath, becoming lighter and more expansive. Backbends present a greater challenge because the neck is taken back into full extension—and often jammed in hyperextension, which translates into pinching in the lower back as well as in the neck. Even the anticipation of moving into a backbend may be enough to tighten the muscles that pull the neck into hyperextension. 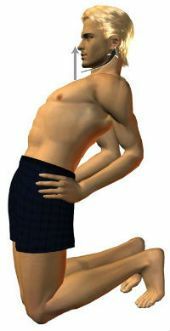 This often happens in ustrasana (camel pose). There is a tendency to take the head back too quickly, “tipping” it back from the top and pinching the neck and lower back in the process. As the back of the neck locks up and the hyoid area of the throat shifts forward, we end up jamming the spine rather than truly opening and extending it. 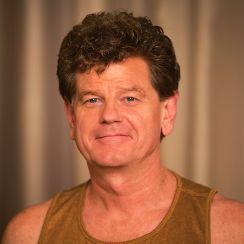 If we allow ustrasana to unfold naturally instead, the pose will teach us proper alignment of the neck and reduce and release tension in the body. (This is one reason why backbends can be so euphoric.) Begin with a lift in your heart as you draw your shoulders back. Then take your head back from the top of the throat, rather than from the top of your head. This is the fundamental movement initiated from the hyoid. When practiced this way, the pose strengthens key postural muscles at the core—especially the longus colli muscles at the front of the neck—which are usually overpowered by gravity as well as by other, stronger neck muscles. Doing the posture correctly demands attention to how you move your neck and head. The moment you allow the top of your throat to shift forward or your head to tip back too quickly, your heart will drop and your neck will grip. If performed with these principles in mind, this and other backbends can give your neck the kind of help it needs to strengthen and rebalance. The fruit of the practice is a steady upright posture which will keep your neck free of tension and distress. Chin Lock or Throat Net? The adjustment to the hyoid calls to mind jalandhara bandha, one of the classic bandhas of hatha yoga. The basic action of jalandhara bandha is to bring the chin toward the chest—and the chest toward the chin—in practices involving pranayama. This relaxes the nervous system, “catching” its wayward fluctuations so as to support meditation. In pranayama, jalandhara bandha opens and positions the dome of the soft palate at the back of the throat, so we can be fully open, relaxed, and responsive to the natural flow of the breath. We don’t quite know how it got its name, but the roots of the word jalandhar are suggestive. Jala is a “net, web, or snare” used in catching birds; dhara means “bearing or supporting.” Though it is usually described as a “chin lock,” for the moment, let’s entertain the idea that this practice concerns the network surrounding the hyoid rather than what the chin is doing. The strands of this “net” are directly influenced by the position of the hyoid; as the hyoid moves, some are tightened while others slacken. 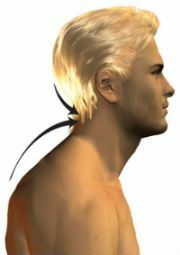 Major muscles at both the front and back body come together at the base of the head. When these muscles tighten, they pull the head forward and down. This causes the shoulders to round forward and the chest to drop. A network of muscles connects the hyoid bone to the breastbone, throat, jaw, face, temporal lobes, and base of the head. Place your fingers where your jaw and throat meet and guide the hyoid back and up. This movement is a cue for the muscles at the back of the neck to release and for the muscles at the front of the neck to extend the spine upward. These muscles lie along the front of the neck bones. When they contract, the neck lengthens upward through the crown of the head. As the heart lifts, the shoulders naturally draw back into place. As they turn the head in this pose, students typically tip it back, shortening the neck and thrusting the chin forward. This causes the shoulders to hunch and creates tension. The adjustment from the hyoid releases this tension, aligning the neck and allowing the pose to open. Students typically throw the head back too quickly, shortening the neck and thrusting the hyoid forward. The heart drops and the lower back pinches. Slide the top of the throat back, lifting your heart while gently lengthening through the crown of the head. Without tightening at the base of the skull or tipping your head back, let your head extend back gracefully as a natural extension of your spine, until your spine moves into your body in a deep, symmetrical arc.